The notion that human thought is structured like a language, with a precise syntax and semantics, has been pivotal in recent philosophy of mind. Yet it is not a new idea: it was systematically explored in the fourteenth century by William of Ockham and became central in late medieval philosophy. 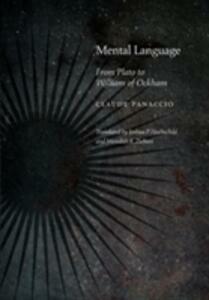 Mental Language examines the background of Ockham's innovation by tracing the history of the mental language theme in ancient and medieval thought. Panaccio identifies two important traditions: one philosophical, stemming from Plato and Aristotle, and the other theological, rooted in the Fathers of the Christian Church. The study then focuses on the merging of the two traditions in the Middle Ages, as they gave rise to detailed discussions over the structure of human thought and its relations with signs and language. Ultimately, Panaccio stresses the originality and significance of Ockham's doctrine of the oratio mentalis (mental discourse) and the strong impression it made upon his immediate successors.